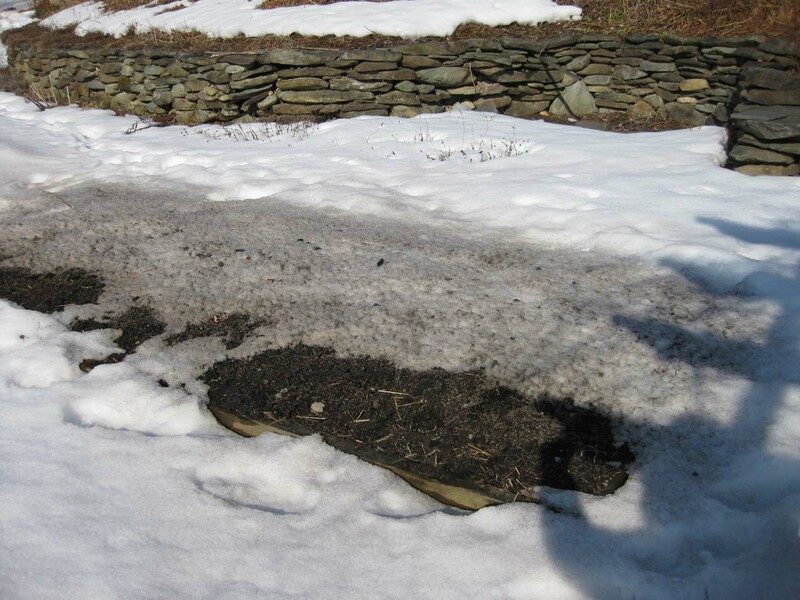 Wood ashes melting snow on bed prepared last fall for early spring planting. To take best advantage of the Zone 4 growing season, get started now —outside. The tenderest spinach,the crispest radishes and nuttiest arugula are grown in the cold. They can survive the inevitable returns to winter over the next couple months so it makes no sense to wait. You can start planting the whole spectrum of cold hardy greens as soon as the ground thaws and dries out,a process you can accelerate with a few simple steps along with some inexpensive props. Remove the snow from area to plant. Shovel it off,or on sunny days,just sprinkle surface of snow with wood ash,dark sand or fine compost (anything dark that’s compatible with the garden) and let the sun do the work. Sprinkle just enough to absorb the sunlight without insulating the snow beneath. Cover with clear plastic so ground will thaw and prevent further rain or snow from being absorbed. Once thawed, dry the bed out by putting the plastic over hoops. Bent pvc pipe, manufactured metal row hoops, bent wire or whatever will get the plastic off the surface of the ground will work,just so hot air can circulate and moisture escapes. Work the soil and plant ONLY after soil in bed is no longer wet. If you work soil when wet it will compact badly! . I’ll provide photos at each step so you can see. Others may have different approaches to making an early start. If so,please share them! Glad I found this info! Thank you for posting.